With all the noise the doom and gloom media is making about tightening credit restrictions and rising interest rates, many homebuyers have been led to think low down payment loans are a thing of the past. Make no mistake, there are many programs still available. One often-overlooked loan program belongs to the U.S. Department of Agriculture (USDA). 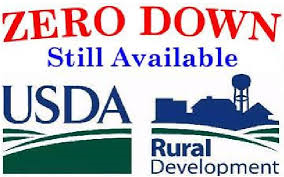 With no downpayment requirement, the USDA’s Section 502 guaranteed Rural Development housing loan has similar credit guidelines and debt-to-income ratios as FHA loans. Tags: homeloan, household median income, hud, low down payment, median income, no MI, no mortgage insurance, U.S. Department of Agriculture, united states department agricultral, usda, USDA loans, zero down, zero down paymentCategories: Loan Products, Need GOOD news? I hope you don’t mind a comment from Down under here in Australia. I came across your blog when looking for similar local blogs. Interestingly your site is No. 1 in the Google rankings down here. Good blog though, it gives very helpful information for would be and existing home owners. PreviousWhy does the Non-Farm Payroll report affect mortgage rates? NextWhy’s the Dad on the Floor?